You can get some kind of "wild bird seed" almost anywhere these days: the hardware store, the pet store, the grocery store. Sometimes they may seem like a bargain, but all too often they are a bad choice for you and your birds. Beware seed mixes that look like the top picture to the right, dominated by red and light-colored round seeds with a few scattered sunflowers. If the ingredient list shows milo, sorghum, wheat, canary seed, significant amounts of corn, or mysterious unspecified "grain products," it probably isn't a good blend. Instead, look for lots of sunflower, which may come in the familiar black shell (as in the middle picture of our Supreme Blend) or in a hulled form (as in the bottom picture of our No-Mess Blend). 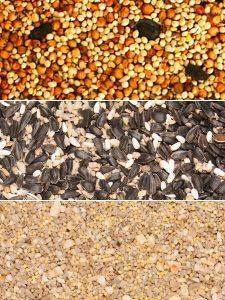 White millet, nuts, or safflower are good secondary ingredients. If you want some straight talk on your current birdseed, we're always happy to give you our honest opinion - there are good seed blends out there other than our own. Dominated by inedible filler grains which waste your money and attract rodents, such as milo, wheat, and mystery "grain products"
Limited choices; often a single, so-called "wild bird blend" which promise all birds, but really is only attractive to a few species. Either small, pricey bags or giant unwieldy bags which are difficult to store and take too long to use up.